Simple construction with adhesive sticker, easy to fix at any place. Mud guards are tailor fit to match your vehicle's fenders perfectly. F it for Toyota Land Cruiser LC 2015-2017 (Will fit models fitted with rear body kit). 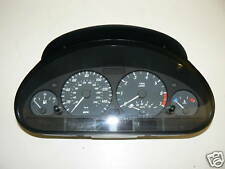 Bmw E36 Speedometer . Condition is Used. Dispatched with eBay delivery – Shutl 1 day. BMW E30 analogue clock in perfect working order. Part no. 1376903. The Digital Roof Clock. The part has been tested on the car and it is functioning as expected and has been taken off with care. Fits: 3 Series F30 F31. 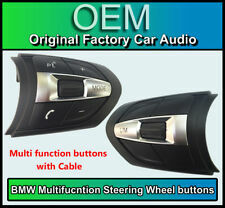 This product fits: BMW 3 Series F30 F31. 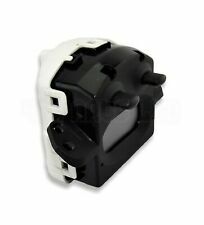 BMW Switch, MF steering wheel, M-Sport, 6131 7 8494 08 -. Wrong Item received / Faulty Item. We are more than happy to replace any item(s) in these instances. Once the mileage has been reset on the clocks, the tamper light will show. If you do not ask and the part does not fit we will not accept responsibility for the error. All new parts are supplied with a 12 months warranty. Part number: 8091040 / 9272664. Fits: F80 F82 F83 (M3 & M4). Genuine BMW. N.B. People may have different opinions when judging the condition of used parts. If you do not ask and the part does not fit we will not accept responsibility for the error. This head unit fits: BMW 3 Series F30 / F31. This unit is rem-. BMW Display Screen, L7 CID MID -. L7 CID MID (shown in image below). If the followingmodel number matches your original screen, this item WILL fit your car! MANY MORE BMW PARTS AVAILABLE. YOUR BMW SPECIALISTS. We will always help you to have a 100% positive happy buying experience. RIGHT HAND DRIVE CAR. SOLD AS PER PICTURE. We will ALWAYS try our best to help. This unit is rem-. Fits BMW X5 E70. This head unit fits: BMW X5 E70. 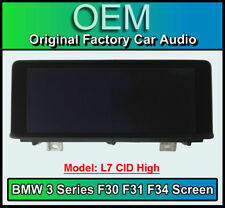 BMW Display Screen, CID 6.5" -. CID 6.5" (shown in image below). If the followingmodel number matches your original screen, this item WILL fit your car! This part was removed from a 2007 bmw x5 3.0d (e70). model was made from 2007 to 2013 with a facelift introduced in 2010. you can search for all parts currently available from this car by entering the reg sk07vot in the search bar. F30 F31 F34. This head unit fits: BMW 3 Series F30 / F31 / F34. L7 CID High (shown in image below). This unit is rem-. If the followingmodel number matches your original screen, this item WILL fit your car! This will be fully working once installed in to your BMW & really enhances the look from the standard speedo in the E6x series cars. - E90, E92, E93 & E60 LCI Rear lights. - SE to M-sport bodykit conversions or M3 and M5 bodykit conversions. Part number: 7844322. Fits: E90 & LCI / E92 & LCI / E93 & LCI (M3). Genuine BMW. If you do not ask and the part does not fit we will not accept responsibility for the error. Good Condition. N.B. People may have different opinions when judging the condition of used parts. BMW Display Screen, CID65 L7 MID -. CID65 L7 MID (shown in image below). This head unit fits: BMW 3 Series F30 / F31. This unit is rem-. If the followingmodel number matches your original screen, this item WILL fit your car! BMW Display Screen, CID65 L7 MID -. CID65 L7 MID (shown in image below). This head unit fits: BMW 1 Series F20 / F21. This unit is rem-. If the followingmodel number matches your original screen, this item WILL fit your car! Fits BMW 4 Series F32 F33. This head unit fits: BMW 4 Series F32 F33. BMW Display Screen, L7 CID MID -. L7 CID MID (shown in image below). This unit is rem-. If the followingmodel number matches your original screen, this item WILL fit your car! 2012 BMW 5 SERIES F10 520d ED. PRE-FACE LIFT MODEL. 2.0 DIESEL ENGINE CODE - N47D20C. PART NUMBER: 9280485. PAINT CODE 300 - ALPINE WHITE 3. 6 GEARS MANUAL GEARBOX - GS6-45DZ. 184BHP / 135KW. We do have a lot of parts for almost every BMW model. Feel free to ask for any other BMW car parts, we are always happy to help. Genuine used BMW part. This item is used but is in good condition and is in full working order. Air Vent Clip, easy to be installed in Dashboard with NO HOLDER, safe and steady. - Dashboard display, elegant and up-end. 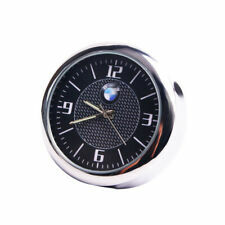 - The latest 3D Cool design Clock in car, which makes your car look more fashionable and slap-up. This unit is rem-. BMW Display Screen, L7 CID MID -. L7 CID MID (shown in image below). If the followingmodel number matches your original screen, this item WILL fit your car! The BMW part number does NOT need. 2011 BMW 5 Series 2010 To 2013 520d SE 2.0 8 Speed Automatic Diesel 4 Door Saloon Multi Function Display Unit With Part Number: 9241826 This part was removed from a vehicle with the engine code: N47D20O1 (N47D20C) All of our mechanical and electrical parts come with a 3 month warranty as standard, this covers the part itself but does not cover any labour charges incurred from fitment or removal of the item. (Terms and Conditions Apply). For extra peace of mind, extended warranties are available upon request at an additional charge. For more information please message us. Please be aware that all our items are removed from right hand drive vehicles unless otherwise stated. If you are unsure if this item will fit your vehicle or if you have any other questions then please call our parts department who will be happy to help. 2013 BMW X3 2011 To 2014 xDrive20d M Sport 4WD 2.0 8 Speed Automatic Diesel 5 Door Estate Multi Function Display Unit All of our mechanical and electrical parts come with a 3 month warranty as standard, this covers the part itself but does not cover any labour charges incurred from fitment or removal of the item. (Terms and Conditions Apply). For extra peace of mind, extended warranties are available upon request at an additional charge. If you are unsure if this item will fit your vehicle or if you have any other questions then please call our parts department who will be happy to help. If you have any problems at all then please message us through eBay and we will happily help to resolve any issues. PART: 2018 BMW 3 Series F31 Multi Function Media Display Screen Monitor PART NUMBER: 6837127 ADDITIONAL COMMENTS: SOME LIGHT MARKS/SCRATCHES ON SCREEN WARRANTY (PARTS ONLY): 3 MONTHS – FREE 6 MONTHS – AN ADDITIONAL 10% OF BUY IT NOW PRICE 12 MONTHS – AN ADDITIONAL 20% OF BUY IT NOW PRICE NO WARRANTY INCLUDED ON CORE UNITS (ENGINES & GEARBOXES) WE DO NOT OFFER EXTENDED WARRANTIES ON PARTS THAT HAVE BEEN ACCEPTED AS A BEST OFFER FAILURE TO SUPPLY ANY EXCHANGE ENGINES OR GEARBOXES WILL INVALIDATE YOUR WARRANTY WE DO NOT COVER ANY LABOUR COSTS EXCHANGES: ENGINES, GEARBOXES & DPFs/CATs ARE SOLD ON AN EXCHANGE BASIS – PLEASE MESSAGE US THROUGH EBAY AND WE WILL COLLECT THE CORE UNIT FREE OF CHARGE RETURNS: ALL RETURNS MUST BE PROCESSED THROUGH EBAY IF YOU WOULD LIKE TO REQUEST A RETURN: 1. FIND OUR ITEM IN YOUR PURCHASE HISTORY 2. BMW Display Screen, CID65 F25LCI L6MU -. CID65 F25LCI L6MU (shown in image below). This head unit fits: BMW X3 F25. This unit is rem-. If the followingmodel number matches your original screen, this item WILL fit your car! (BMW X5 Misc 0000365106. Other Details: Mk3 (F15) 13-18 F15 Heads Up Display Nippon Seiki Make. This item was removed from a 2016 vehicle. Jersey, Guernsey, Scilly Isles) as well as for the Scottish Highlands. Part Number: 6965359. If you do not ask and the part does not fit we will not accept responsibility for the error. All new parts are supplied with a 12 months warranty. N.B. People have different opinions on condition when describing used parts. F10 F11 F07. This head unit fits: BMW 5 Series F10 / F11 / F07. This unit is rem-. BMW Display Screen, L6-CID 7" -. If the followingmodel number matches your original screen, this item WILL fit your car! 2' F23 (03/2014 — 06/2017). Part removed from: BMW 1' F20, 116d, 5 doors, N47N, EUR,Right hand drive. 1' F21 (07/2010 — 02/2015). 1' F21 LCI (06/2014 — 02/2018). 2' F22 (10/2012 — 06/2017). 1' F20 (07/2010 — 02/2015). BMW Display Screen, CID65 F23 L7 MID RL -. CID65 F23 L7 MID RL (shown in image below). Fits BMW 2 Series F22 F23. 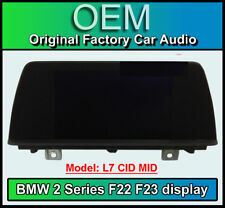 This head unit fits: BMW 2 Series F22 F23. This unit is rem-. If the followingmodel number matches your original screen, this item WILL fit your car! PART: 2016 BMW 3 Series F30 3.0 Saloon Multi Function Display Unit 9270393 PART NUMBER: 7335391 ADDITIONAL COMMENTS: Please see images WARRANTY (PARTS ONLY): 3 MONTHS – FREE 6 MONTHS – AN ADDITIONAL 10% OF BUY IT NOW PRICE 12 MONTHS – AN ADDITIONAL 20% OF BUY IT NOW PRICE NO WARRANTY INCLUDED ON CORE UNITS (ENGINES & GEARBOXES) WE DO NOT OFFER EXTENDED WARRANTIES ON PARTS THAT HAVE BEEN ACCEPTED AS A BEST OFFER FAILURE TO SUPPLY ANY EXCHANGE ENGINES OR GEARBOXES WILL INVALIDATE YOUR WARRANTY WE DO NOT COVER ANY LABOUR COSTS EXCHANGES: ENGINES, GEARBOXES & DPFs/CATs ARE SOLD ON AN EXCHANGE BASIS – PLEASE MESSAGE US THROUGH EBAY AND WE WILL COLLECT THE CORE UNIT FREE OF CHARGE RETURNS: ALL RETURNS MUST BE PROCESSED THROUGH EBAY IF YOU WOULD LIKE TO REQUEST A RETURN: 1. Gran Coupe F36. This head unit fits: BMW 4 Series Gran Coupe F36. BMW Display Screen, L7 CID MID -. L7 CID MID (shown in image below). This unit is rem-. If the followingmodel number matches your original screen, this item WILL fit your car! PART: 2013 BMW 3 Series Multi-Function Display Screen Unit PART NUMBER: 9270393040 ADDITIONAL COMMENTS: N/A WARRANTY (PARTS ONLY): 3 MONTHS – FREE 6 MONTHS – AN ADDITIONAL 10% OF BUY IT NOW PRICE 12 MONTHS – AN ADDITIONAL 20% OF BUY IT NOW PRICE NO WARRANTY INCLUDED ON CORE UNITS (ENGINES & GEARBOXES) WE DO NOT OFFER EXTENDED WARRANTIES ON PARTS THAT HAVE BEEN ACCEPTED AS A BEST OFFER FAILURE TO SUPPLY ANY EXCHANGE ENGINES OR GEARBOXES WILL INVALIDATE YOUR WARRANTY WE DO NOT COVER ANY LABOUR COSTS EXCHANGES: ENGINES, GEARBOXES & DPFs/CATs ARE SOLD ON AN EXCHANGE BASIS – PLEASE MESSAGE US THROUGH EBAY AND WE WILL COLLECT THE CORE UNIT FREE OF CHARGE RETURNS: ALL RETURNS MUST BE PROCESSED THROUGH EBAY IF YOU WOULD LIKE TO REQUEST A RETURN: 1. FIND OUR ITEM IN YOUR PURCHASE HISTORY 2. SELECT OPTION (RETURN THIS ITEM) 3. Fits: 3 Series F30 F31. This product fits: BMW 3 Series F30 F31. 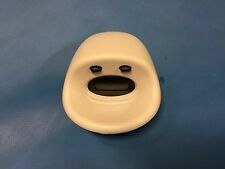 BMW Switch, MF steering wheel, Sport, 6131 9225710 -. Wrong Item received / Faulty Item. We are more than happy to replace any item(s) in these instances. Used, good condition and functioning clock. Taken from BMW E36 323i. E46 2.2Petrol 5Spd Convertible. Convertible 320 Ci - 2.2 Petrol - 5 Speed Manual - Showing 173376 Miles - In Good Working Order. This part was removed from a Right Hand Drive Vehicle. Compatibility is a guide only. MANY MORE BMW PARTS AVAILABLE. YOUR BMW SPECIALISTS. RIGHT HAND DRIVE CAR. SEND REQUESTS & WE WILL LIST AS BUY IT NOW. We will ALWAYS try our best to help. We will always help you to have a 100% positive happy buying experience. 880170201 Please be aware this part is used, previously fitted second hand item. There may be some cosmetic scratches and or marks. Please view all images. All parts are supplied with a 6 Month Guarantee (Please view our Terms of Sale) The information below shows details of the donor vehicle. This is to be used as a guide only. Any mileage information shown is not guaranteed.